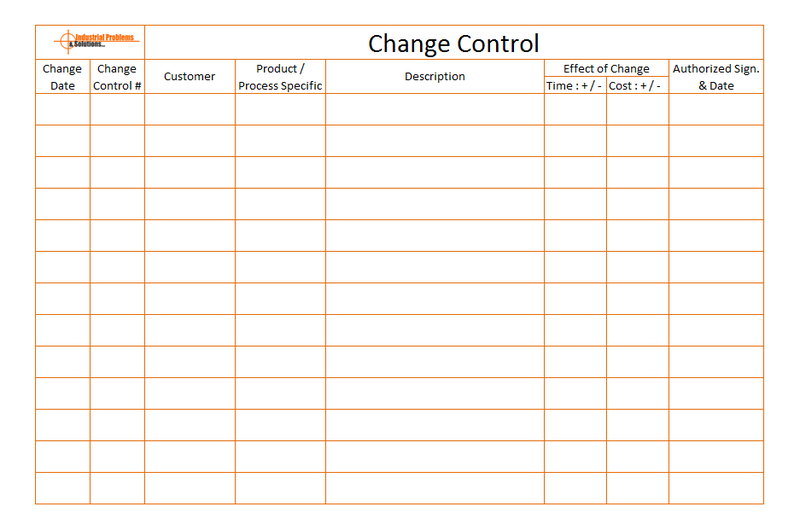 What is change control process? Change process control is systematic approach, or key to controlling the changes to manage the impact to the product or system’ goals and objectives. Mostly in industry when any products are regular supplies are no issued, but if any changes are made by customer in product or process, some improvement or implementation are made that movements very toughest to controlling on each sections of products implementation or process section, its all most happen that not to possible to avoid by supplier, they have to change made as required by customers. So what to do for fully controlled on the changed parameters are requested by customers? Whether any changes in product drawings / specifications, Product or Process change or improvement, amendment, modifications, request to customer for the provide changes drafts for the same. All requested changes will be important part of the each section to concern product / process improvement & possible changes. Ensure that change is feasible to implement as technically and commercially. Consider that, if change is possible to implement functions which may be affected shall be identified, what documents are need to reviewed? That is control records you have to check for possibility. Further any new development happen as we discussed in previous article (APQP) must refer to understand more knowledge, you have to also refer APQP Process to concern APQP that considering when any new development happen. Next will be incorporate all changes in relevant documents are reviewed and impacts will be shows in concern documents, level effect of change shall be studies though process validation studies supported with initial process capability studies, studies that called SPC ( Statistical Process Controls ). All the relevant processes and performance trends shall be monitor to ensure effectiveness of changed processes and documents will be support to the level of effectiveness, PPM trends – the document should be maintain for the same. After all the required changes and verified effectiveness needs to impacts on the processes that made, time of decisions regarding permanent implementation of change shall be initiated. Control records will be change when we decided to permanents changes in product or processes. All the relevant master documents, documents lists should be revised to indicate latest changes status. Impacts of the documents can divert the right position need to care during the finalize documents, amendments and changes are made. Further Step is Process are changed is implement in production line and check the process validation. That as output of the process show the success of the implementation of changes are made in line with customer requirements.